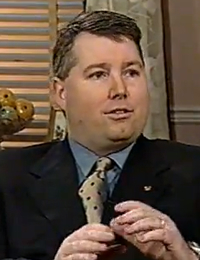 On December 21, 2000, Paul McKeever (Freedom Party of Ontario) was a guest of Rhonda London Live. In this episode, McKeever discussed with host Rhonda London a recommendation by a federal transportation agency that obese air passengers be given two seats for the price of one, arguing that obese passengers are disabled and should be given accommodation for their “special needs”. Also guests in this episode: Helena Spring (Canadian Association for Size Acceptance) and Hugh Scher (lawyer, Scher and DeAngelis). Featuring: Paul McKeever (Freedom Party of Ontario), Helena Spring (Canadian Association for Size Acceptance) and Hugh Scher (lawyer, Scher and DeAngelis).